DOGS. 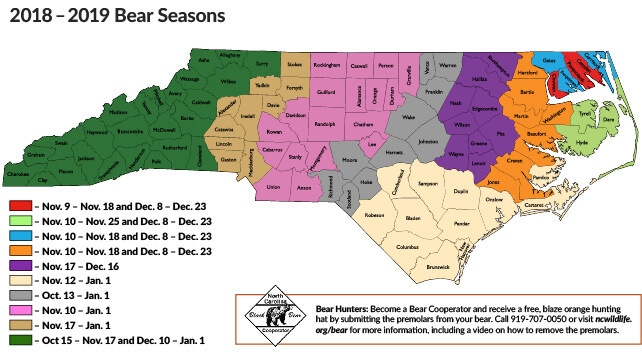 Hunting bears with dogs is prohibited in the following counties or parts of counties: Alamance south of I-85, Anson west of N.C. Hwy 742, Cabarrus, Chatham, Davie, Davidson, Forsyth, Gaston, Guilford, Lee, Lincoln, Mecklenburg, Montgomery, Orange south of I-85, Pamlico (per local law), Randolph, Rockingham, Rowan, Stanly, Union, and Wake south of N.C. Hwy 98. In all other counties, hunting bears with the use of dogs is legal during open bear seasons, but restrictions may apply on game lands. See “Game Land” section for further information. UNPROCESSED FOODS. Legal during the Monday on or nearest October 15 to the Saturday before Thanksgiving* in and west of Surry, Wilkes, Caldwell, Burke and Cleveland counties. In all other counties, unprocessed foods may be used to aid in taking of bear during any open season for bear. * The prohibition against taking bears with the use and aid of bait does not apply to the release of dogs in the vicinity of any food source that is not a processed food product. However, dogs may not be released in the vicinity of any commercially available mineral supplement whether placed for the purpose of attracting deer or otherwise. to take a bear while in the act of consuming unprocessed foods; to place processed food products as bait in any area of the state with an established season for taking black bears. Processed food products are any food substance or flavoring that has been modified by the addition of ingredients or by treatment to modify its chemical composition or form or to enhance its aroma or taste. This includes: food products enhanced by sugar, honey, syrups, oils, salts, spices, peanut butter, grease, meat, bones, or blood; candies, pastries, gum, and sugar blocks; and extracts of such products; to use any bear bait attractant, including scented sprays, aerosols, scent balls, and scent powders; and to place any sort of processed or unprocessed foods on game lands.